Melanie and Khai attended this year’s HERCULES School in march and I urged them to share their experiences with us. This is their story, but everyone who is interested in the instructor’s point of view should check out our other blog post about the HERCULES School. Since 1991, every year in March the HERCULES course takes place in Grenoble, France. This 5-week long international course offers 72 participants of different research fields (biology, chemistry, physics, material sciences, geosciences) the unique opportunity to learn about numerous X-ray and Neutron techniques and even to apply them at different research facilities. The course starts with different basic lectures and refreshers to the topics crystallography, spectroscopy, magnetism and many more. 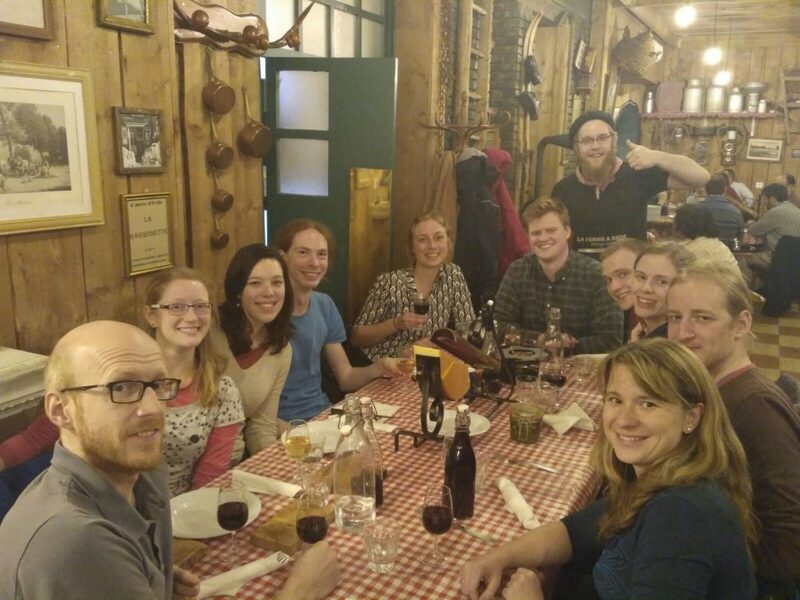 The first week was brightened up with tours through the neutron source Institute Laue-Langevin (ILL) and the European Synchrotron Radiation Facility (ESRF) as well as several social activities, like a Cocktail Evening, a Poster Session, a Welcome Dinner and Snowshoes Outing. In the second week, we had more specialized lectures, tutorials and practicals at the ILL. The third week started with practicals at the ESRF, where some of us performed measurements at “forbidden” reflections. 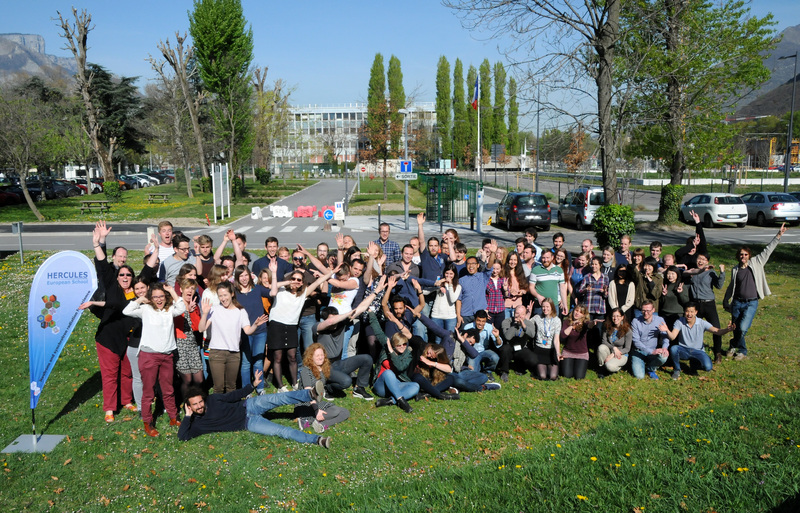 During the fourth week, our big group was split into three subgroups to perform external practicals at other X-ray and Neutron sources outside Grenoble: Villigen (Switzerland), Trieste (Italy) and Paris (France). Each subgroup investigated different samples using different techniques during a one-day or two-day experiment. The Paul-Scherrer-Institute (PSI) in Villigen comprises the synchrotron Swiss Light Source (SLS), a neutron spallation source (SINQ), a muon source (SμS) and the Free Electron Laser (SwissFEL). This research facility surprised us by its extraordinarily rural area. Here, really focused research is guaranteed. We stayed in the guest house, with its luxury TV room, big kitchen and (most important) gaming room with table soccer and darts. We got tours around all major parts of the facility and even through the tunnels of the synchrotron and the SwissFEL. In Paris-Saclay, we had one day of lectures, half a day on optics-calculation-tutorial, two days at the fancy synchrotron SOLEIL [For those who understand French, SOLEIL stands for Source optimisée de lumière d’énergie intermédiaire du LURE (Laboratoire pour l’utilisation du rayonnement électromagnétique) –Ed.] and one day at the Neutron Laboratoire Léon Brillouin (LLB). Each day, we performed an experiment at a different beamline but on the same sample. At the end of the week, we had to analyse and compile all data together and present the results in a short presentation. Our hotel Residhome Appart Hotel was located in Massy-Palaiseau, only 20 min. away from Paris city center. After each exhausting day, we had the opportunity to relax in a swimming pool, a jacuzzi and two saunas. Next to the scientific experience, we had two sunny days to visit the beautiful capital city of France. The last subgroup went to Trieste and visited the synchrotron ELETTRA and the Free Electron laser Radiation for Multidisciplinary Investigations (FERMI). Unfortunately, none of us was there, but we have heard that the Italian food (pizza, pasta, etc.) is indeed magical. Before they drove back to Grenoble (14 hours bus drive), they did a detour to Venice and spent a day there. In the last week, all participants came back to Grenoble for the last lectures and tutorials. The school ended on Thursday with a presentation about the life of the mythological Hercules, followed by a farewell Wine and Cheese party, where bit-by-bit people left for the airport to go home to their beloved families/friends and science. This course is a unique opportunity to learn “everything” about synchrotron and neutron techniques but also to form a worldwide network with other scientists in similar research fields. Farewell Cheese and Wine All the happy participants! Dieser Beitrag wurde unter AK-Junge-Kristallographie abgelegt und mit story verschlagwortet. Setze ein Lesezeichen auf den Permalink.